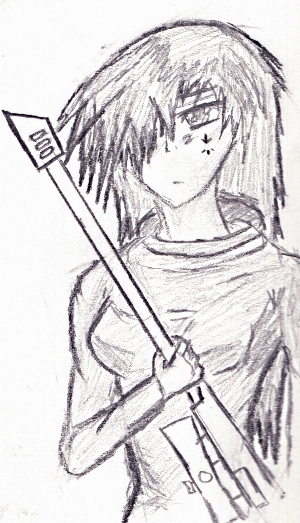 Aria is a quiet sniper who is one of the survivors in Reiko-10. She is routinely ignored and comes off as a little stalkerish, despite this she is incredibly observant and tremendously skilled with rifles as well as having a decent medical skill set. Aria: Background: A quiet, trusting girl; a deep, once-thought-requited love between two star-crossed lovers. A happy, endless summer marred by the oncoming darkness. Rain quickly washing tears down as a promise was made to forever bind the two souls together. A long, forlorn wait upon a high cliff, clutching her love’s rifle to her sad and lonely chest. A promise she had forever intended to keep twisted and turned in her fragile soul, pleading to not be forgotten. Her screams and wails echoed night after night through the canyons below, a plead to have not been forgotten. A dark truth that gradually began to dawn on the once pure and untainted maiden. A promise that meant so much to her lay broken at her stumbling, bloody feet. The place promised in their early days left behind without a second glance. A long lonely quest for answers, for redemption. The ending to the tale in a rough storm, a once crying, emotional girl quietly looking onwards at her once-love. The trigger pull and unmissed shot killed more than the man and woman behind him that it was intended for. She was eventually pressed into military service under some forgettable name as she was found wandering the streets in a slight daze. Her actual name is unknown; her old military name was Suzene. Her unit commander, a man named Valent, had a strange attraction towards the odd girl that was reciprocated as much as it could with no words ever being spoken. She did not ever talk, and he hardly ever spoke himself. He was an amazing shot with a rifle, and when her training brought her into contact with a rifle, he was impressed with the change in her bearing; she seemed stronger and focused by simply having a rifle. Her shooting was a sight to behold, however. Together, the two of them had a strange, perverse relationship together as two highly accurate assassins. When they were finally torn apart, she left him with her necklace. Looking back at what happened, she was surprised at what had occurred that night. She cried, as they sat there on a cliff they had coincidentally come to that was not unlike one she had been at earlier in her life. She simply stated the words “remember” as she handed her necklace to him. The only thing he could possibly offer her to remember him by was a song they had listened to while there were together. The song was an aria from a long ago history on Terra. Personality: A remarkably powerful presence accompanies Aria anywhere she goes despite the fact she rarely, if ever, speaks a single word. Accounting for this strange feeling one gets around her is the fact that she is such a beautiful young woman who face is always so downtrodden and her eyes reflect a pain that no one could possibly understand. She looks to be on the edge of emotional breakdown constantly, but in reality it is a dark, steady state she has forever put herself in. She has long passed the point of such meaningless things as crying or friendship, and calmly looks on the world with a dark experience that far transcends her age. Her only friend, besides her old rifle she has kept for so long, is Valant, who is now going by Zaier. He has changed a lot since she last saw him, possibly facial reconstruction, but the fact that he still wore her necklace was impressive to her. Still, she cannot bring herself to actually tell him she is the girl that gave him that necklace so long ago. The fact that she herself had been put through gene shifting likely attributes to the fact that Valant seems unsure as to whether this is the girl he had known so long ago. She has the longest hair in Reiko-10.